Fort King George (1721-1734) - A British colonial fort established in 1721 by British troops commanded by Colonel John Barnwell. Named after British King George. Abandoned in 1734. Fort King George Moat and Palisade. 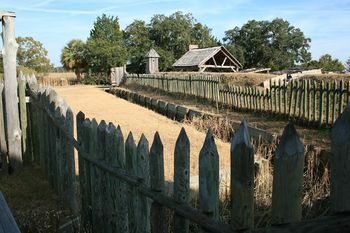 Established in 1721 as the first fortification in colonial Georgia, some 12 years before the colony was officially established. The fort's purpose was to provide a deterrent to Spanish and French settlement of the area. Fort King George Barracks Interior. Originally built as a small triangular fort on a bluff above the north branch of the Altamaha River. The main structure was a three story 26' square blockhouse that provided protection for the residents. There were several internal support buildings including a barracks, officer's quarters, a latrine and several smaller buildings. The whole complex was surrounded by a moat with a log palisade down the center of it backed by an earthworks parapet. The blockhouse was sturdily built with four inch thick walls and provided protected firing positions for riflemen and small cannons and included a magazine on the lower level. 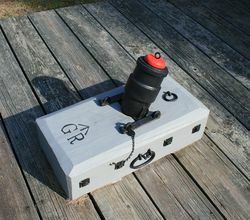 Four sentry boxes were provided, one at each corner of the compound. Fort King George Coehorn Mortar. Armament for the fort included nine cannon emplacements along the river side of the fort, a Coehorn mortar, and a swivel gun. The blockhouse also mounted small cannons on the second floor and provided loopholes on the third floor for firing muskets at any enemy. Construction began in the summer of 1721 and was completed in 1722. 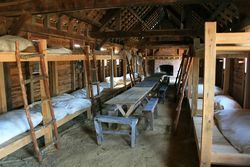 Life at the fort proved very difficult and there were many deaths from disease, malnutrition and the inhospitable conditions around the site. In 1727 the garrison withdrew leaving behind two caretakers/lookouts and a graveyard with about 65 graves. It may be that as many as 140 officers and soldiers died at the fort in its six years of operation, most from non-combat causes. The site was permanently abandoned by the British in 1734. 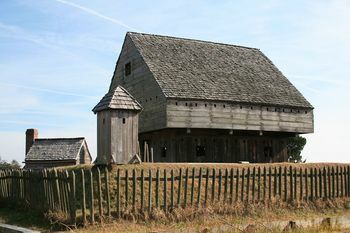 Reconstructed fort with a three story blockhouse, buildings, moat and palisade, period guns and mounts in place. Location: Fort King George State Park, Darien, McIntosh County, Georgia. This page was last modified 10:08, 17 March 2019 by Bill Thayer. Based on work by John Stanton.